I recently started following the lovely Rhiannon from The Barbelle. Rhiannon primarly runs a fitness/lifestyle blog, with a few posts on beauty and fashion here and there. She's actually the person who has inspired me to start Blogilates, especially after noticing how much wait I've put on (I'll let the banoffee cheescake I had on Sunday night slide)! I'm really enjoying reading her blog and is the one I'll be turning to when I fancy food I shouldn't be eating! Hi there, I'm Rhiannon from The Barbelle! When Amy offered some guest post slots for her blog, I knew I had to give it a shot. I only discovered her amazing blog about a month ago, and it's already become a firm favourite of mine! Hopefully you find my guest post interesting! I'm a bit of an addict when it comes to fitness. If I'm not at cheer practice, I'll be at the gym, out running, or doing some Blogilates home workouts! I love the satisfaction when you can lift a little more, run a little further, or hold that plank for longer! It does however take it's toll on my body, and after a hard week's exercise it's always nice to treat myself to a bit of pampering. By Sunday my muscles are achy, I'm tired and the last thing I want to do is anything strenuous or that requires too much thinking! So after work/training I plonk myself on my bed, light a scented candle and spend the evening giving myself some TLC. 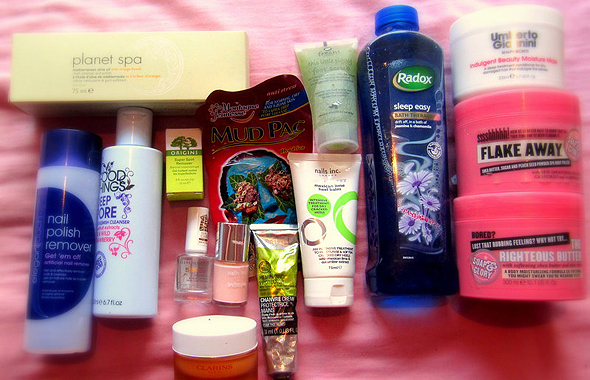 These are the main products I tend to use, although they do change slightly week to week depending on how I'm feeling! First things first is using the Avon Hot Cloth Cleanser to get rid of the day's makeup and then double checking it's completely done by giving my face a quick wipe with my Good Things Anti-Blemish Cleanser. I'll also take off my nail varnish from the week before getting the bath running! I've had a few of the bubble baths from Radox's Bath Therapy range and I've loved all of them so far. They smell divine and are super relaxing as well as being super bubbly! I normally whack on a face mask whilst I'm waiting for the bath to fill up and then have a good ol' soak. Soap & Glory's Flake Away is my favourite body scrub at the minute. It's got big chunky particles of sea salt, sugar and peach seed powder, combined with almond oil and Shea butter which leaves my skin feeling smooth and looking nicely polished. After washing my hair, a hair mask is next on the bill and I've recently been reaching for Umberto Giannini's Moisture Mask from their Beauty Secrets range. It has a nice, light, salon-esque scent to it, and whilst it says to leave it on for a minimum of three minutes, I tend to leave it on overnight as my hair is terrible for looking dry and straw-like! After the bath it's moisturising time and I have so many different moisturisers for different things, when - as I write this - I'm pretty sure some of them could have multiple uses! I'll moisturise my face and pop on some Origins Super Spot Remover on any spots I may have, and then slap on some of Soap & Glory's Righteous Butter. 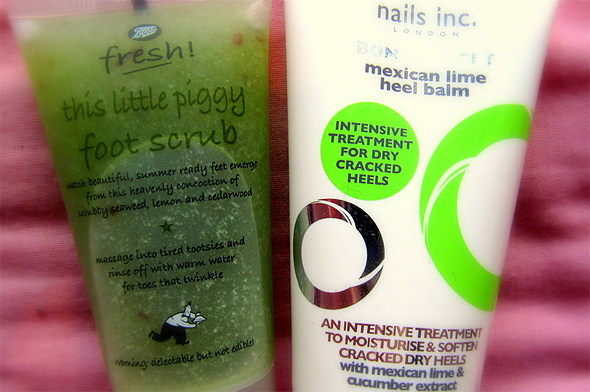 Nails Inc. Mexican Heel Balm is awesome for soothing sore feet, and makes my feet feel brand new after using it with some moisturising socks. Nails are the last thing I do as I like to sit in front of the television whilst they dry - I'm a really impatient person so they end up getting smudged if I don't have something to keep my mind occupied! Before applying any nail varnish, I always use Body Shop's Hemp Hand Protector. It doesn't really smell that appealing but it's an awesome moisturiser, and as I'm only going to be going to sleep, I doubt that it really matters all that much if my hands don't smell flowery! Nails Inc's Peach Sorbet is the one which I went for last week, as it suits my skin tone really well and makes me look ever slightly more tanned (if that makes any sense at all!). I finish it off with a top coat and voila! - pampering session complete! It may seem like a lot of effort to go to for some, but for me it's the perfect solution for unwinding on a Sunday evening, so that I'm preened and refreshed for the week ahead. What do you do when you just need to chill out? 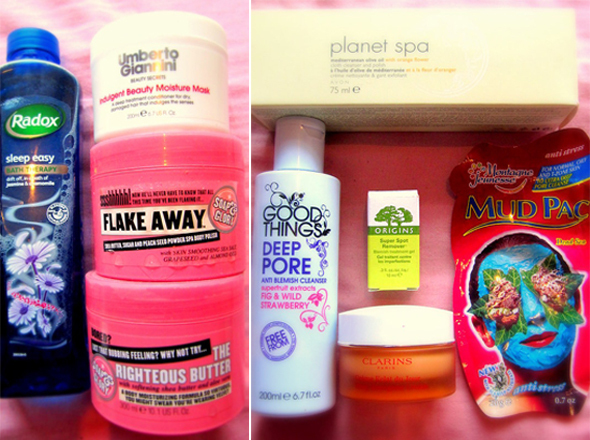 Do you have any products which you always reach for when you feel like a bit of a pamper? She's definitely recommended some winners! You really can't beat a nice face mask! I agree with the face mask comment! I would use them every day if it was good for me, haha! 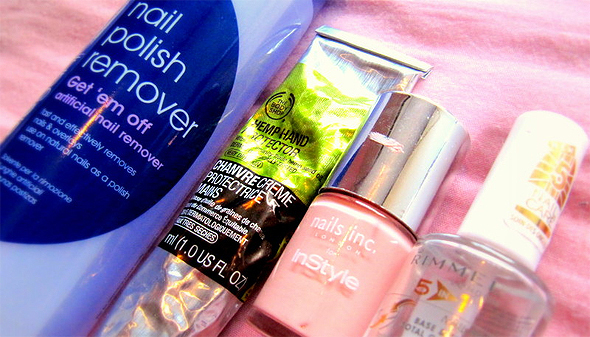 I found your blog tonight on #bbloggers, and it's exactly the sort of thing I've been seeking out! I love your attention to detail. Oh, thank you! I also love Righteous Butter - have a full size as well as a travel size, it lasts ages too! A long soak in the bath definitely relaxes me! I love "Flake Away" by soap and glory, great scrub! i like this guest post, i'm going to check out your blog!